Lawrence Wilcox in 1949. He died in Korea in 1950. This photo was taken on Lawrence's only leave home. Photo 3089, shared by Carrie Wilcox Farset. Forward by the editor: Lawrence's family lived in both Table Rock and Steinauer and is claimed by both. He attended schools in both towns at one time or another and four of his siblings graduated from Table Rock. There is no battle over this young Marine but rather a joining of forces to honor him. The Steinauer Heritage House has gathered memories and information about him. Included are the memories of Marjorie Obrist Morrissey- Steinauer Class of 53; Sue Steinauer Miles- Steinauer Class of 1953; Ethelreda Gottula Pella- Steinauer Class of 1948; Kay Steinauer Wehrbein-‘Steinaurer Class of 1949; Bob Steinauer- Steinauer Class of 1952; Jim Wenzl, Steinauer Class of 1945; and Don Wenzl, Steinauer Class of 1949. Lawrence Wilcox was a young man who died 67 years ago, 6,000 miles from home to help ensure freedom for strangers. It was in the Korean War, called often now the “Forgotten War." Certainly when he joined the Marines he did not plan to be in a war nor dead by his 18th birthday. He did not get a chance to make his mark on the world. He made the ultimate sacrifice in the service of his country. This history was prepared for the Heritage House by Carol Sisco, based in large part on information and narrative provided by Lawrence Obrist. Lawrence (third from left) with siblings Doris, Lyle, and Bob. Photo 3088, shared by Carrie Wilcox Farset. Lawrence A. Wilcox (1932 - 1950) was one of the dozen children of Addie and Ernest Wilcox: Herald, Richard, Lyle, Robert, Lawrence, Ruth, Doris, Jean, Dorothy, Lourain, Lucille and David. 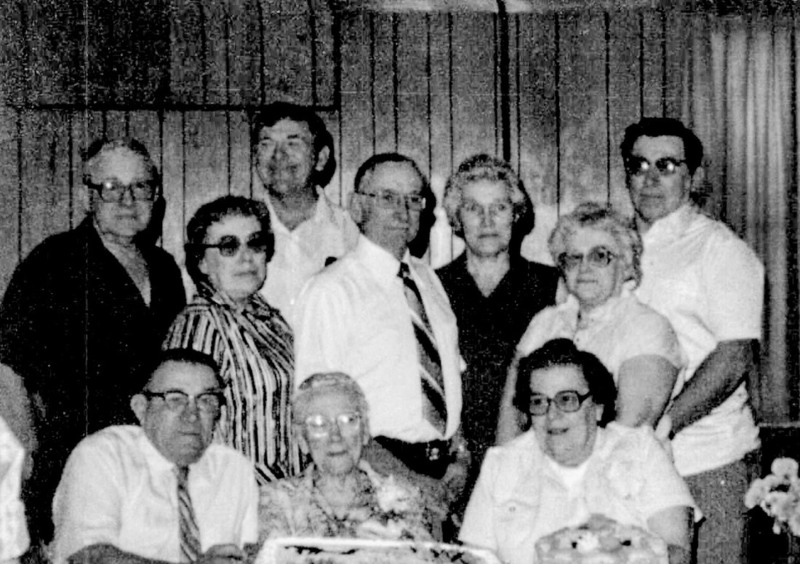 The family originated from the Table Rock area and Lawrence and maybe two sisters moved with the parents to a farm north of Steinauer, near the Wenzl families' farms. Four of the kids had graduated from Table Rock High up to 1948. Grade school for Lawrence was in Table Rock. Current best estimates have him as a Freshman & Sophomore at Steinauer, 1946-48 or until he turned 16 in Aug. 1948. Photo 3086, shared by Carrie Wilcox Farset. Lawrence was well known to Jim and Don Wenzl as a bit of a wild and fun loving kid. His transport was his horse from home to school/town. He took a shine to Shirley Steiner Morehead who also rode a horse from her home SW of Steinauer for high school. Both boarded their horses during the school day at the barn of Norbert Steinauer. Shirley transferred to Pawnee for her senior year to graduate in 1948. After he turned 17 years old (August 15, 1949), he joined the Marines. That was in October 1949. Given his farm background, I am sure he did not have trouble with physical training at the the San Diego Marine Corps Boot Camp. He did have just one leave according to his niece Carrie Wilcox Farset. That is when the photo of him in front of an automobile was taken. One alumni remembers meeting him at a dance in the Community Building in Tecumseh during that leave. When the Korean War began on June 25, 1950, the military was in a panic to find troops to help hold back the invading North Korean Army into South Korea. Lawrence departed San Diego 14 July 50, part of Co. B, 1/5 Marine Regiment attached to the temporary 1st Provisional Marine Brigade. Instead of landing in Japan for training and preparations as had been the plan given them, they went directly to Korea. They arrived on August 2. They were sent straight into combat. The military was fighting pressing advances of the North Korean Army near and around Pusan. On August 6, Lawrence's 1st Provisional Marine Brigade was attached to the Army’s 25th Infantry Division. His unit was involved in the battles of the Chindong-ni-Sachon offensive that month. On August 12, the North Koreans infiltrated a regiment in the Task Force's rear. On August 13, 1950 -- less than two weeks after arriving in Korea -- Lawrence was listed as missing in action from the CHANGCHON AMBUSH while defending the Pusan Perimeter. A later "Final Disposition" decision determined that he had been killed in action on September 1, 1950. His unit was defending its position on Hill 202, which overlooked the Sachon River near Sachon, South Korea. One and possibly two servicemen from Pawnee County died in combat during the Korean War. Although he was a relatively-brief resident of the Steinauer area, he is one of few Steinauer servicemen who died in action in ground combat during all of the past war time periods. It took almost 10 months for the body of Lawrence to reach home for burial as detailed in the news article that appeared in the Table Rock Argus. Table Rock Argus, July 5, 1951. A full Military Funeral will be held Friday of this week for Pfc. Lawrence A. Wilcox, son of Mr. and Mrs. Earnest Wilcox of the Steinauer community, who was killed in action in August, 1950, while fighting with the Marines in Korea. He was 18 years old. Services will be held in the Methodist Church in Table Rock Friday afternoon at 2:00 p.m. with Rev. Oden of Hickman, Nebraska, Reserve Marine Chaplain, conducting the services, assisted by Rev. E. P. Booher of Elk Creek. Marine pallbearers, a Marine Color Guard, and a local Legion Post firing squad will be included in the final rites. Local Legion Post members met the body at the train Wednesday afternoon and escorted it to the Kovanda-Beethe Funeral Home. Burial will be made in the Table Rock cemetery. 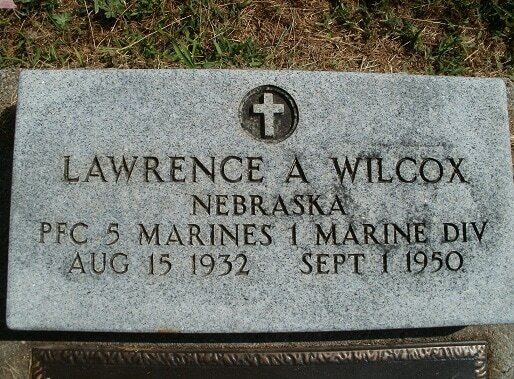 Lawrence Wilcox joined the Marines in October, 1949, and after basic training was sent to Korea, where he was listed as missing in action on August 13, 1950. On September 1, 1950, the War Department reported him as having been killed. Wilcox attended grade school in Table Rock and had attended high school here before enlisting with the Marines. Table Rock business places will close from 1:45 to 3:00 p.m. during the funeral services. Here is Lawrence -- third fromthe left -- with brothers Rich, Lyle, and Chauncey. Note that Lawrence is in a Navy uniform -- but he was in the Marines! And Lyle, too is in in a Navy uniform, but he was in the Army! According to Carrie Wilcox Farset, who shared this picture, Lyle and Lawrence (the two in the middle) were still in high school. Their brothers were home from the Navy, so just for fun, the two high school kids dressed up in their brothers' uniforms. That explains it! (We leave out the Navy jokes about the Marine Corps and vice versa.) Photo 3085, shared by Carrie Wilcox Farset. The military background of Lawrence's family was also exhibited by his Uncle Kenneth Wiar who was born in Table Rock and grew up in Falls City. Kenneth's father Oscar was the brother of Lawrence's mother. Like Lawrence and other members of the Wiar and Wilcox families, Kenneth is buried in the Table Rock Cemetery. Kenneth died in 1946 after a re-enlistment as the result of a self-inflicted gunshot wound. He was probably a victim of what we now know as PTSD. 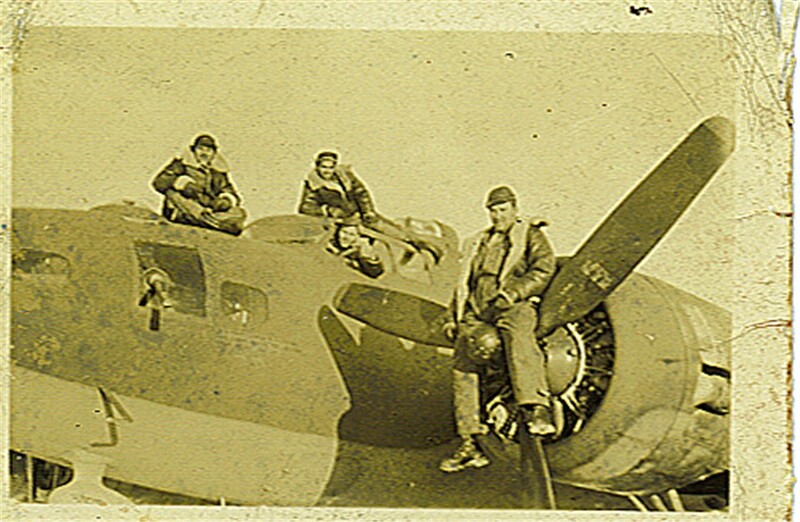 Kenneth was the turret gunner on an Army Air Force bomber. 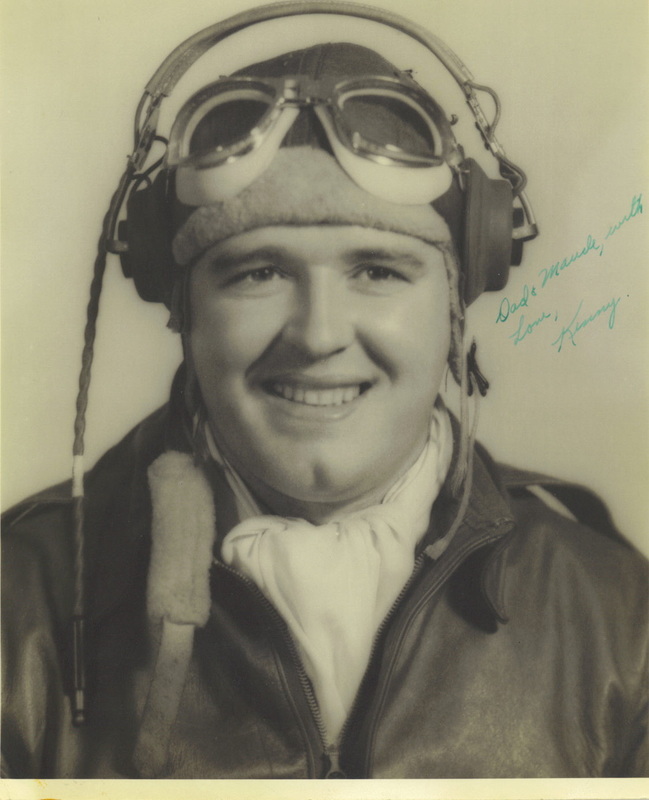 He earned the Distinguished Flying Cross . He participated in several raids on the Japanese Kariles early in the war from distant bases and when the going was rough. He was a prisoner of war. His obituary relates, "On the last trip he made, the bomber was crippled and was forced to fly on to Siberia where the plane landed and the crew was interned under conditions of wartime secrecy. After a few months in Siberia the Russians returned Wiar and other members of the crew to United States control under strict secrecy, because Japan then was at peace with Russia and such transfers violated the strained friendship between the two nations. After returning from Siberia, Wiar was hospitalized for several months for combat fatigue." An earlier newspaper article had previously recounted the circumstances of his death. Lawrence uncles Bob and Oscar Wiar, brothers of Lawrence's mother, were World War I veterans, here in a family photograph shared by Diane Anderson. Lawrence's family had a military background. Byron Wilcox, on the left, was Lawrence's grandfather. He was a Civil War veteran. Byron's son Ernest was Lawrence's father. lawrence was surely missed at every family gathering in the years to come. Photo 3083, Wilcox family, undated, shared by Carrie Wilcox Farset. 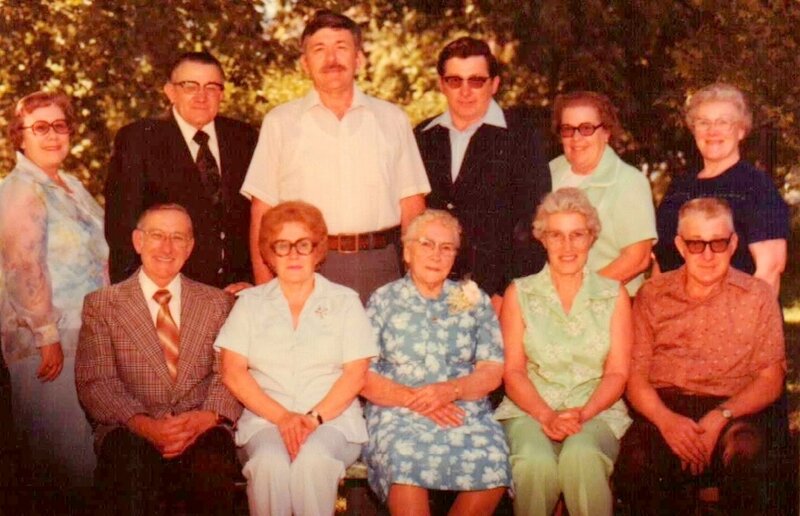 Wilcox family, shared by Carrie Wilcox Farset. The Table Rock Historical Society of Table Rock, Nebraska welcomes visitors year round. Contact us at TableRockHistory@gmail.com for details. We have many things not yet posted. Let us know if you have any special requests.